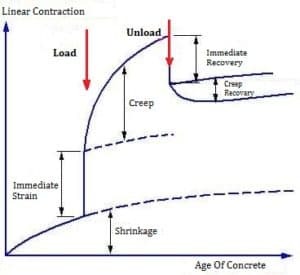 Creep can be defined as the elastic and long-term deformation of concrete under a continuous load. Generally, a long term pressure changes the shape of concrete structure and the deformation occurs along the direction of the applied load. When the continuous load is removed, the strain is decreased immediately. The amount of the decreased strain is equal to the elastic strain at the given age. This quick recovery is then followed by a continuous decrease in strain, known as creep recovery that is a part of total creep strain suffered by the concrete. The rate of creep is increased with increasing water cement ratio. It is influenced by humidity and drying condition of the atmosphere. The rate of creep rapidly decreases with time. The time taken by a concrete structure to attained creep is 5 years. Aggregates with moisture movement and low elastic modulus cause a large amount of creep. The rate of creep generally decreases with the increase of the size of aggregates. Some admixtures (mainly accelerators) are also responsible for causing creep in concrete.